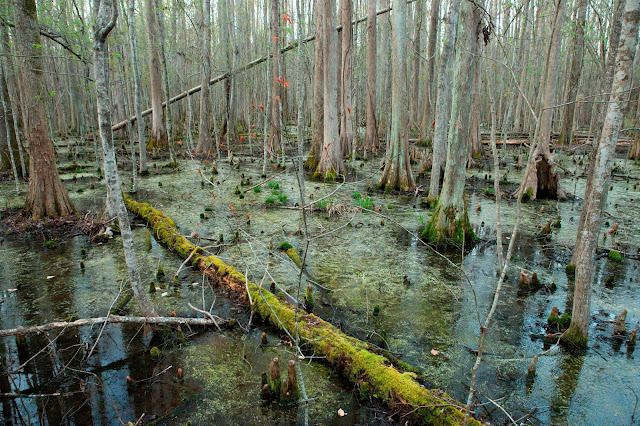 A place of fear for some, the Great Dismal Swamp was a place of refuge for others. Col. William Byrd II, an 18th century planter, is credited with giving the swamp its name on maps during his 1728 expedition to survey the border line between Virginia and North Carolina. When colonists began invading their land, Native Americans moved into the secluded forests of the swamp. 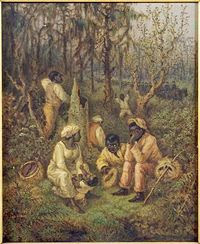 Later, they were joined by runaway slaves and indentured servants seeking freedom. Trackers tried to use dogs to find these runaways, but the scent was soon lost in the water of the swamp, and horses couldn’t walk through the muck. Even canoes couldn’t navigate the water, so pursuers weren’t able to catch the fugitives and gave up the chase, considering them lost to the dense, tangled vegetation and ooze, teeming with poisonous snakes, clouds of mosquitoes and other hostile creatures. Surely, the runaways became victims of the treacherous environment into which they’d run. Indeed it was because of the swamp’s hostility and its vast size covering thousands of acres of southern Virginia and North Carolina that enable hundreds, if not thousands of slaves to escape to freedom, many through the Underground Railroad, popularized by Harriet Beecher Stowe. But only in recent history has evidence been discovered of communities where inhabitants lived with little help from the outside world. Even archaeologists got lost trying to research the swamp’s interior. But in 2004, Dan Sayers, historical archaeologist and chair of the anthropology department at American University in Washington, D.C. was taken to a 20-acre island inside the swamp by one of the biologists who study the area. There, Sayers discovered layers of civilizations and evidence of an established community. Since then, he has found outlines of cabins and fragments of tools, weapons, and white clay pipes. For perhaps hundreds of years, these inhabitants, also called “Maroons” lived off the vegetation and hunted and fished for food on one of the two hundred inhabitable islands hidden within the swamp. His book, A Desolate Place for Desperate People, details the independence of these people. Today the swamp, now a wildlife refuge, has dwindled to 112,000 acres due to drainage and encroaching civilization. Since the end of the Civil War, no communities have existed within its deep interior. The very idea that people could have survived in the midst of such a hostile environment boggles the mind. But to the swamp’s inhabitants, freedom was worth the price of the hardships of the Great Dismal Swamp. Award-winning author Marilyn Turk lives in and writes about the coast – past and present. A multi-published author, she writes a weekly lighthouse blog at http://marilynturk.com. 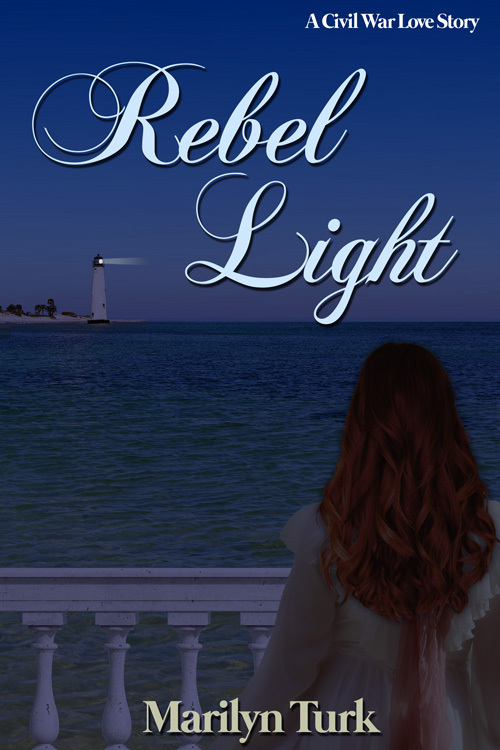 Her latest release, Rebel Light, Book 1 in the Coastal Lights Legacy series, is now available along with A Gilded Curse, and Lighthouse Devotions on amazon.com. I definitely see the hand of God at work in this story...He provided an escape for those seeking refuge. It was hostile, yet they were protected. This is fascinating. Thanks for sharing. Yes, a great analogy for how God provides refuge. Thanks for your comment. that area. Amazing what people did to obtain freedom. Is it a protected wetland now? I know, Kathleen. I only thought swamps were in Louisiana or Florida before I learned about this one. I remember seeing the signs for is when we drove through Virginia a few years ago and found the name intriguing. Yes, I believe it is protected now, but a lot of damage has been done to the ecosystem by civilization. MIchigan actually used to be quite swampy too. I thought it was funny they made the state motto "If you seek a pleasant peninsula look about you" as I figured they were trying to entice people to settle here. When people first came here to settle they had problems with the "ague" or as we know it, malaria! That is hard to believe, Kathy, since Michigan is a higher altitude (I think) than down south. I think of rocks and firs and the Great Lakes when I think of Michigan, not swamps! Wow! I never knew this and I lived on the edge near this swamp for many of my growing up years in N.C. Thanks for your fascinating post. My home state of Kentucky was a very important part of the Underground Railroad and it is amazing that these inhabitants were some who were seeking this means of escape. 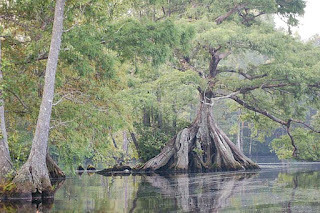 Interesting post about the Great Dismal Swamp. Amazing what the inhabitants were able to accomplish to succeed with their escape.